There are 7 Assisted Living Facilities in the Rice Lake area, with 5 in Rice Lake and 2 nearby. 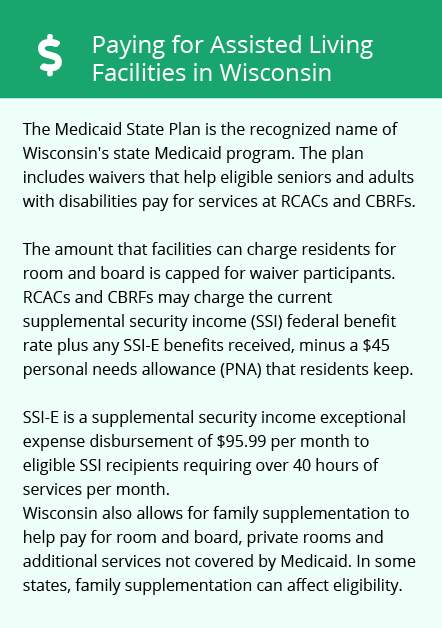 The average cost of assisted living in Rice Lake is $4,275 per month. This is higher than the national median of $3,345. Cheaper nearby regions include Spooner with an average starting cost of $4,200. To help you with your search, browse the 6 reviews below for assisted living facilities in Rice Lake. On average, consumers rate assisted living in Rice Lake 4.8 out of 5 stars. Better rated regions include Barron with an average rating of 5.0 out of 5 stars. Caring.com has helped thousands of families find high-quality senior care. To speak with one of our Family Advisors about assisted living options and costs in Rice Lake, call (855) 863-8283. Rice Lake, Wisconsin, located in the Red Cedar River Valley, provides outdoor recreation, public services and entertainment within the rural northwest portion of the state. The town has a small population of almost 8,400 people, and about 20 percent of those residents are 65 or older. Accommodations for seniors include seven assisted living facilities, with five in Rice Lake and two in nearby Barron. In Rice Lake and throughout Wisconsin, assisted living communities are categorized as community-based residential facilities (CBRFs) or residential care adult complexes (RCACs). CBRFs serve residents who need up to three hours of weekly nursing care, while RCACs provide independent apartments within a supervised complex. The weather in Rice Lake scores a moderately low 34 out of 100 on Sperling's Comfort Index. Seniors may find the winter weather a little harsh, as the average January low is only 3 degrees Fahrenheit, and the area gets about 54 inches of snow each year. The summers are more pleasant, with an average July high of 80 degrees. The overall cost of living is lower in Rice Lake than the state and national averages, primarily from lower housing prices. Seniors can expect to pay lower prices for groceries in Rice Lake; however, the costs of health care, transportation and utilities are higher than the national average. The Rice Lake area is home to world-class medical facilities, including Marshfield Medical Center, in the event of medical emergencies or illness. Personal safety may be a concern for seniors in Rice Lake, as the local chance of crime victimization is 1 in 26. The rate of violent crime is slightly lower than average for Wisconsin, but the rate of property crime is almost double the state average. Public transportation is provided by Rice Lake City Cab through Running Inc. This is a door-to-door service, and seniors pay reduced fare. Rice Lake offers many senior-friendly attractions for arts and culture, such as the Japanese Friendship Garden, the Pioneer Village Museum, the Northern Star Theatre Co. and the Hunt Hill Audubon Sanctuary. Assisted Living costs in Rice Lake start around $4,275 per month on average, while the nationwide average cost of assisted living is $4,000 per month, according to the latest figures from Genworth’s Cost of Care Survey. It’s important to note that assisted living rates in Rice Lake and the surrounding suburbs can vary widely based on factors such as location, the level of care needed, apartment size and the types of amenities offered at each community. 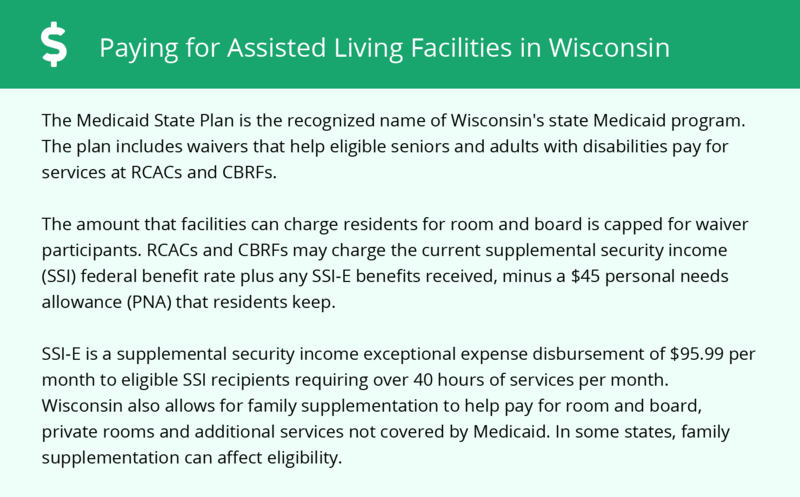 Seniors with Medicaid in Wisconsin may qualify for financial assistance through the Family Care program or the Program for All-Inclusive Care of the Elderly (PACE). These programs cover long-term care services in a person's home of choice, which includes CBRFs and RCACs. Rice Lake and the surrounding area are home to numerous government agencies and non-profit organizations offering help for seniors searching for or currently residing in an assisted living community. These organizations can also provide assistance in a number of other eldercare services such as geriatric care management, elder law advice, estate planning, finding home care and health and wellness programs. To see a list of free assisted living resources in Rice Lake, please visit our Assisted Living in Wisconsin page. Rice Lake-area assisted living communities must adhere to the comprehensive set of state laws and regulations that all assisted living communities in Wisconsin are required to follow. Visit our Assisted Living in Wisconsin page for more information about these laws.